The living room area has a dining table that seats 6 comfortably and a wide screen TV. The condo is beautifully furnished with new furniture with two full beds in the master bedroom, dresser and TV and air conditioner. The master bath off the master bedroom has his and her sinks and a tub and shower combination You can relax on the lanai off the bedroom and watch the stars at night and see beautiful rainbows in the morning. The second bedroom has one full bed, 1x bunk beds with a TV and air conditioner. The second bathroom has a nice dressing area, a washer and dryer, and a toilet and tub and shower combination. There are several closets for you clothes during your visit. We furnish an ironing board and iron, hair dryers in each bath room and all towels and wash clothes, Highspeed Wireless WiFi also included. You can cook meals in the great kitchen area where you will find a full stove with an oven, dishwasher, full double door fridge with ice maker and freezer. You can save tons of money by preparing meals during your stay. All the cooking pots and pans, blender, toaster, rice cooker and other cooking utensils are furnished. Next to the kitchen, you will have a dining area with a table and four chairs to enjoy your meals. We can provide a highchair and a crib if requested. 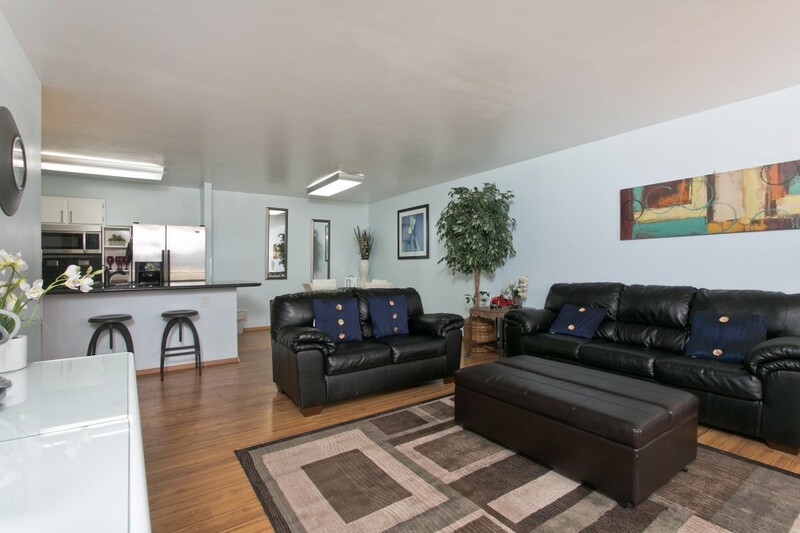 In the living room area, you will have one full-size sofa sleeper, large 55 inch TV with High Definition TV cable. You will also have free WiFi in the condo. Off the living room, there is a large lanai with breathing views of the Manoa Valley. There is lanai furniture where you can sit and relax and enjoy a drink and the views. The Royal Kuhio building has a huge recreation deck on the seventh floor with a swimming pool, Bar-B-Que and picnic table, tennis courts, basketball court, putting green, sauna, and vending machines. There is a coin operated laundry, pay phones, and areas for relaxation in the shade and in the sun.